Members who attended Ohio Leadership Camp are pictured with the state officer team: (front row, l-r) Joe Helterbrand, Lexey Hetzel, Lana Grover, Heather Burba, Jordan Williamson, Michael Rose, Kirsten Harp, Alora Brown and Haley Hughes (back row,l-r) Grace Lach, Kalyn Strahley, Emma Dearth, Mallory Caudill, Koleson McCoy, Gretchen Lee, Grant Lach, Holly McClay and Austin Becker. 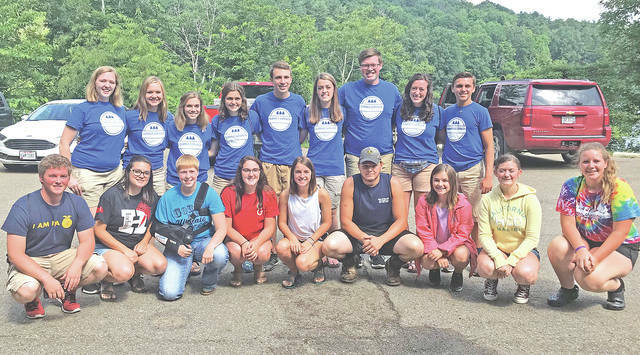 Over the weekend of June 22-25, eight officers and two members of the Hillsboro FFA attended Ohio Leadership Camp at Ohio FFA Camp Muskingum. While there they got the chance to experience a series of sessions learning about leadership and relationship building. The weekend was spent getting to know each other better as well as meeting new people and making lifelong friends. On the Saturday of the camp, students got to the opportunity to see what their local governments look like by running through a mock school board meeting. They had the chance to split off into groups and make up a budget to propose to the school board. “It was a great opportunity to see what gets put into our own school budgets,” said Hillsboro FFA Officer Kirsten Harp. Also on the Saturday of camp members had the opportunity to experience a poverty dinner. Throughout the dinner they watched a video on what the world would look like with only 100 people in it. How many would be high class, low class, or in poverty. Everyone at camp was split off into high, middle and low class as well as poverty. They were fed and treated the way people in those classes would be treated in real life. “It was such an eye-opening experience that I think everyone should have the opportunity to sit through. It changed my view on how people are all the same, but just get dealt different things,” said Hillsboro FFA Officer Heather Burba. The members spent a lot of time getting to know new friends as well as the state FFA officer team, and even a national officer. They had the chance to explore new opportunities like motor boating, kayaking, canoeing and paddle boards, as well as shotgun and rifle ranges. On the last full day of camp a banquet was held to honor the sponsors and some veterans. During the banquet we heard from Ohio national officer candidate Ryan Matthews from Leesburg. Following the banquet the group went through a flag retirement ceremony and heard an eye-opening speech from two veterans. “It was so cool to get to see something that meant so much to those veterans. And a bald eagle even flew over head during it, so that made it even better,” said Hillsboro FFA Officer Joe Helterbrand. After all that the group went to a dance and had the time of their lives with their new friends before heading home the next day. Submitted Lexey Hetzel, Hillsboro FFA. https://www.timesgazette.com/wp-content/uploads/sites/33/2018/07/web1_FFA-pic-1.jpgMembers who attended Ohio Leadership Camp are pictured with the state officer team: (front row, l-r) Joe Helterbrand, Lexey Hetzel, Lana Grover, Heather Burba, Jordan Williamson, Michael Rose, Kirsten Harp, Alora Brown and Haley Hughes (back row,l-r) Grace Lach, Kalyn Strahley, Emma Dearth, Mallory Caudill, Koleson McCoy, Gretchen Lee, Grant Lach, Holly McClay and Austin Becker.